As part of the program required by General Motors for a dealership to sell the Chevrolet Volt, those dealers must buy various tools needed to properly service the electric vehicle. While many of the components of the Volt require no special tools to service the electric Chevy, those items that relate specifically to the Voltec electric drivetrain are unique compared to what dealership technicians would use to work on something like a Camaro or Impala. During 2012, approved Volt dealerships spent between $1,800 and $2,800 on special tools but due to some changes in company procedures, the price of those unique tools for the Volt has spiked to over $5,100 – forcing some dealerships to stop carrying the electric Chevrolet sedan due to low sales and low overall interest in the vehicle. The new tooling costs focus mostly around a new company procedure for how they want the battery system of the Chevrolet Volt handled for repairs. In 2012, GM would have the dealership send the entire 435 pound battery pack to the company for servicing but starting in 2013, the company wants only certain components sent back. This policy change requires the dealership to disassemble the Volt’s battery pack which requires some special tools and – most importantly – a tool used to completely and safely drain the Volt’s battery. That battery draining device costs a whopping $4,735 and it makes up the bulk of the increase in the price of tools required to service the Volt. Since General Motors expects those dealerships which sell the Chevrolet Volt to be able to offer a full complement of services to the buyers, if a dealership isn’t willing to buy the tools to service the Volt – they will not be permitted to sell the popular electric vehicle. The Automotive News spoke with one dealership in New York who has decided to drop the Chevrolet Volt based on the new required tool expenses after selling only 5 Volts in the last two years. Like the other dealerships around the US which sell the Volt, this particular dealership had to spend roughly $5,000 in preparation for the Chevy EV to cover the costs of tooling, training charging stations and while that dealership states that they have broken even on that initial investment – the low sales just don’t justify the high costs to stay in the Volt sales and service program. It makes good sense for those dealerships selling very few Chevrolet Volt electric vehicles to opt out of the program as if the cars aren’t selling well in that area – not offering the car will not have that much of an impact on their total sales. According to General Motors, while 2,614 of the 3,079 American US Chevrolet dealerships are certified to sell and service the Chevy Volt, 70% of sales this year come from the top 300 dealerships. Based on the 20,828 Volts sold through the first 11 months of 2012 (December sales figures are not in yet), 14,580 of those units have been sold by 300 dealerships while the other 6,248 Volts were spread across the remaining 2,314 dealerships that offer the Volt. That means that the “other 30%” of Volt sales would account for an average of less than 3 cars sold per dealership this year. One major incentive for some dealerships to buy the additional $5,100 in tools to work on the Chevrolet Volt is the upcoming Cadillac ELR – a 2-door luxury coupe based on the Volt’s chassis and powerplant architecture. Dealerships who want to sell the ELR will most certainly be expected to offer the same level of service and that will require the same tools as the Volt program. Those dealerships who already sell and service the Chevrolet Volt – and who also plan to sell the Cadillac ELR – will be able to spread the cost of the tools out across two models so it should be less of an impact to the bottom line. However, for those Chevrolet dealerships who do not plan to sell the Cadillac ELR and who also face incredibly low annual sales figures, the idea of incurring another $5,100 in special tooling for a car that does not sell well at their dealership is out of the question. While the actual bottom line impact of these dealerships (both to GM and to the dealership itself) will be very minimal in terms of Chevrolet Volt sales and service, the Volt is one of those vehicles that has a way of drawing in customers who very likely won’t buy a Volt anyway. With a price tag starting north of $40,000, the Chevy Volt isn’t going to generate the big sales like the Cruze, the Malibu or the Impala. However, the Volt is the kind of car that can create some new traffic into the dealership as people want to check out the Volt in person. Even if they don’t plan to spend over $40,000 on a new electric Chevy, the car gets them in the dealership and can result in the sale of a lower priced, fuel friendly vehicle like the Cruze Eco. These dealerships who are dropping the Volt from their showroom lineup may see more impact from that angle than from the direct loss of Volt sales and service but with a price that tops $5,000 for this year alone – the decision to pull the Volt from the showroom will likely prove to be a smart one for those smaller dealerships. These are not unusual costs. A complete set of transmission tools for servicing the latest generation of 6-speeds is close to $4000. Dealers that are too small to have the needed equipment should not be a dealer. The Chevy Spark and Caddy ELR are coming soon. 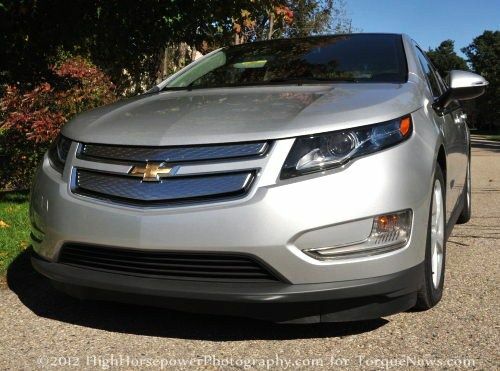 By the way, the Chevy Volt sales tripled in 2012 vs. 2011 and outsold half of the 250 car models sold in the USA in 2012. Did I say doubled? Oops. Chevy Volt sales tripled in 2012 vs 2011.